Not that long ago, Lehigh football players had to take those dreaded 4 O’Clock exams, an essential, dreaded part of the Lehigh experience. Today, though the 2015 Lehigh Mountain Hawks are getting areport card of a different sort. Past the halfway point of the season, it’s time to take a step back and see where the Mountain Hawks are, and where they need to go to get back to the top of the Patriot League. The season, as befitting a young team, has been inconsistent. At times, Lehigh has looked like a team that could possibly win the Patriot League title. At other times, though, they haven’t. Fortunately for all Lehigh fans, the Mountain Hawks last game, a gritty 21-10 win over Bucknell, was the equivalent of acing the mid-term exam. That win, which brought Lehigh back to a 3-3 record, was huge. But tougher challenges await in the last five weeks of the season. You don’t have to have attended more than twenty-five years of Lehigh football games to know it’s a completely different world out there for your friendly neighborhood sports fan. Nowadays there’s way more entertainment options on a typical college weekend than ever, and it’s very logical to think that the increased amount of competition might not just keep students away from attending football games, but local fans as well. It’s not an issue confined to Lehigh – in 2014, home attendance at all FBS games dropped to their lowest levels in fourteen years. As student options have increased across the country, home attendance has decreased. It’s a question worth asking at a school like Lehigh – how to get fans to the games, and keep them coming back? “Have fun writing this game up,” a journalist friend helpfully told me on Saturday when the Mountain Hawks fell behind 4-1. No, Virginia, it wasn’t a whole lot of fun writing up Lehigh’s drubbing by UNH. Losses are no fun for any Lehigh football fan, of course. It’s no more fun to write about a oh-so-close-to-a-win game against James Madison than it is to give up fifty points to your mortal rival. It was awful hard to grasp at some positives about a game which was pretty much over at halftime. The biggest one of all is that this is not the FBS, where a September loss can spell the difference of the plus-one playoffs and a mid-tier bowl. Even though Lehigh is 0-2, they are not knocked out yet. Face it – it was a weird weekend without Lehigh football. It’s been a while since the Mountain Hawks have had a bye weekend this late in the season, and while Lehigh “disappeared” from the Patriot League title race this weekend, a lot more became clear in the Patriot League title race while they were not playing a football game this Saturday. 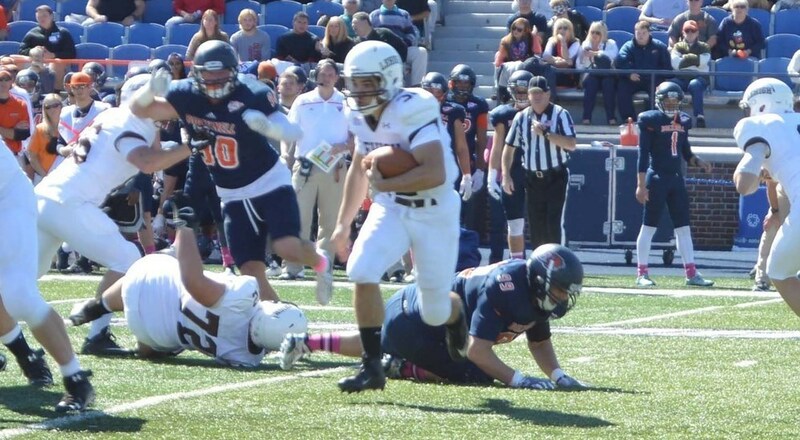 Lehigh reappears this week with a simple goal: win this week, and get to next week. But there’s no margin for error. One loss, and realistically, Lehigh can watch their chances at a Patriot League championship and the FCS playoffs “disappear”. Late on Monday night, senior QB Brandon Bialkowski delivered the news that Lehigh fans feared, but also suspected: that he will be gone for the rest of the year with season-ending collarbone surgery. It appears that the collarbone was broken so badly that he’ll need an iron plate and screws to reconnect it. The guy we call “BB” got hurt in the game against Bucknell, after leading the Mountain Hawks to a 6-2 record and positioning Lehigh towards another potential Patriot League title. We are now officially down to single digits. Only 9 days until opening day vs. Central Connecticut State, and in excitement is getting to be fever pitch.